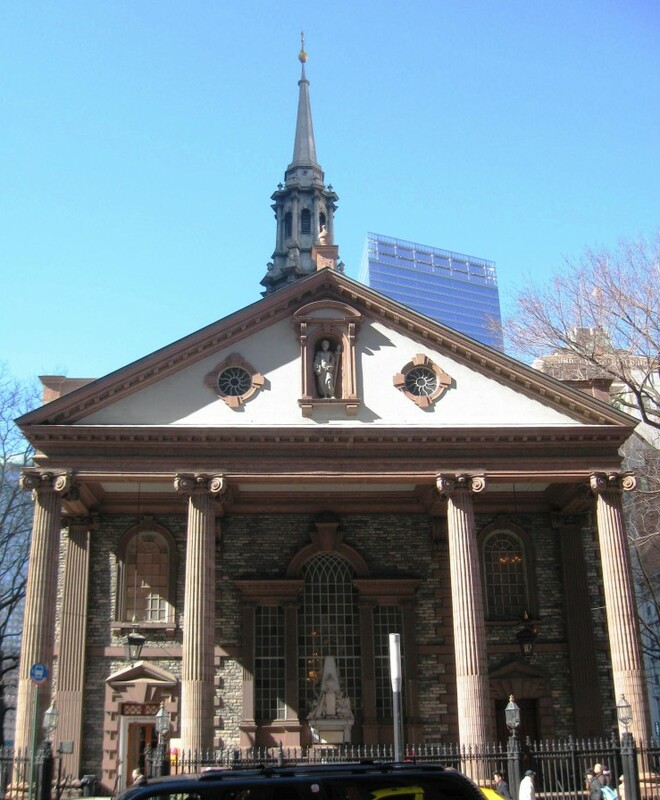 St. Paul’s Chapel in Lower Manhattan held a solemn Mass for Peace yesterday afternoon commemorating the 13th anniversary of the September 11th terror attack. 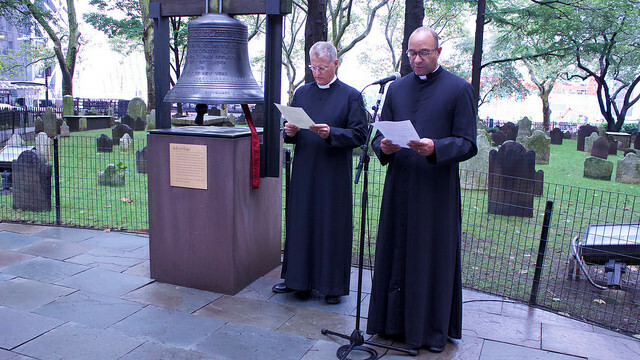 After the Bell of Hope was rung in the churchyard, Vicar Anne Mallonee delivered a homily on the church’s mission of hospitality in the face of adversity – a message that resonated with many who witnessed the city’s oldest church become a place of deep solace and comfort in the weeks and months proceeding 9/11. In the wake of the attacks which killed thousands, St. Paul’s Chapel served as a sanctuary for rescue workers and volunteers alike. Firefighters, doctors, construction workers, chefs, and clergy created a volunteer ministry here, often stealing away short naps on church pews before resuming daunting 12-hour rotations. 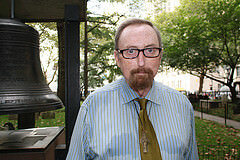 John McCann, 54, of SoHo, came to St. Paul’s Chapel 25 years ago and is currently a lay Eucharistic minister with the church. He was one of 14,000 volunteers involved in the massive relief effort based at St. Paul’s in the weeks following the attacks. 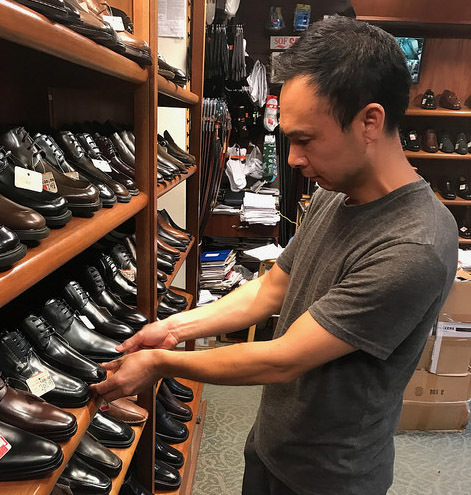 Throughout the years, McCann has watched St. Paul’s Chapel become something of a pilgrimage site, a place people keep coming back to. With the completion of the 9/11 Memorial and Museum nearby, McCann says he has noticed a significant increase in visitors to the church. “We have over two million people a year coming into this church. Our big goal is hospitality. We welcome everybody,” he said. Among those welcomed today was Gary Neilson, a salty resident of Throggs Neck in the Bronx. 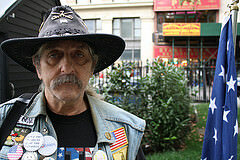 Neilson, in his sixties and clad in a denim vest emblazoned with political pins, comes to Lower Manhattan each year on the anniversary of 9/11. A sense of duty compels him. Neilson, who lost a firefighter friend during 9/11, plans to keep coming back to Ground Zero each year in order to honor all of the victims. One World Trade Center looms large over the church and the 9/11 Memorial is a stone’s throw away. But Neilson has no interest in either. He sees each as exploitative and disrespectful. “I wouldn’t wear a 9/11 Memorial t-shirt! C’mon, that’s ridiculous. It’s like wearing a holocaust t-shirt,” he yelled above a din of construction. 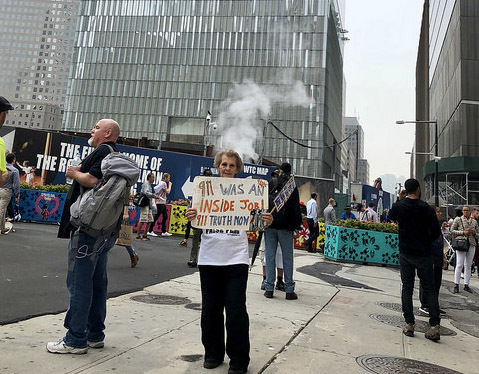 Instead, Neilson, like many here today, has decided to pass through the churchyard in order to get a sense of St. Paul’s deeper connection with the events September 11th 2001. As the mass concluded, visitors wandered out into the churchyard. The scent of burning copal drifted through the open doors along with clergy and congregation. The Eucharistic minister John McCann greeted a young couple as they exited.